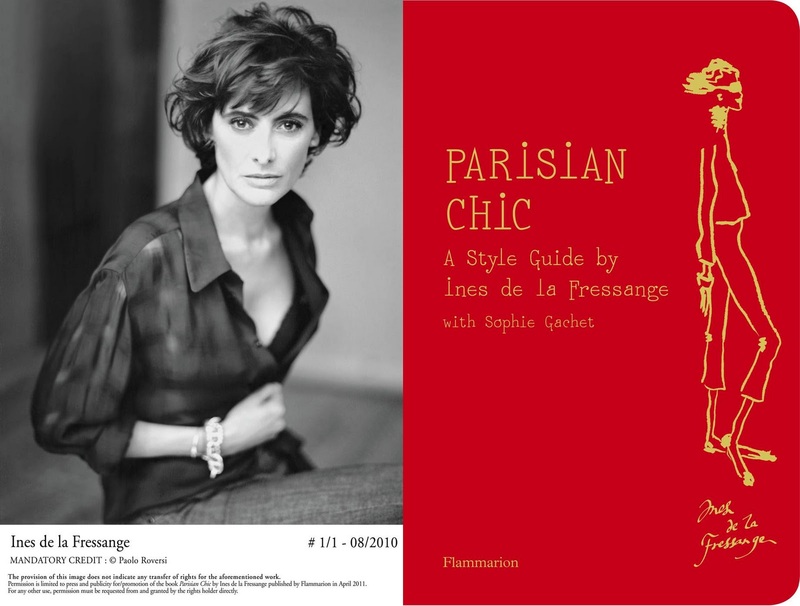 I picked up Ines de la Fressange's new release, "Parisian Chic" with, as they say, great interest. What's not to admire about this stylish sylph, Chanel model, Roger Vivier ambassador and designer of her own label? Like other style guides, she promises to unlock the secrets to looking offhandedly, fabulously chic, in an I-don't-give-a-damn-cherie way. First, you will learn the Magnificent Seven basics that you must own. Go ahead, guess. I'll bet you get five or six: man's blazer, trench, navy sweater, tank, LBD, jeans, leather jacket. Add accessories. You have more leeway here, Ines likes the vintage It bags, antique earrings, charm bracelets, cuffs. Never "a chunky necklace with chunky earrings", in fact a necklace worn with earrings is listed in her fashion faux pas list. "It should come as no surprise that scarf rings are prohibited." Ethnic print tunics and dresses in African batik prints; "past a certain age, they look like costumes"
There is advice I find weird and unworkable: she champions velvet jackets (among other items) worn two sizes too small. Ines' thinking reflects her reedy body type, so dressing like a ten year old boy growing out of his gear has some charm for her. 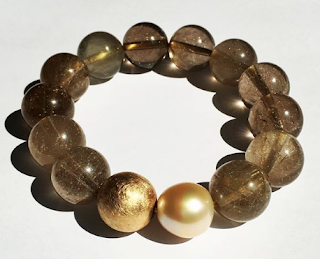 Her basic tenet is "Don't wear your clothes too predictably", for example, do pearls with your tee, diamonds with military gear, mix it up. She suggests Converses with an evening gown, moto boots with a chiffon dress, effects adorable on my friend's 22 year old daughter, but not on 60+ moi. Still, the concept is useful; I could incorporate some of her ideas, trying a chartreuse print shirt instead of the predictable white tee with jeans. Do you really need to spend your $25 to hear that sparkly, glittery makeup does not suit 50+ faces... twice? Her observation that "A stroll with your fiancé in the direction of Tiffany's is the best shortcut to a radiant complexion (and the air is just right inside–very good for the skin)" is the silliest sentence among a number of contenders. When I read the list "For lifelong beauty: Be well groomed...smell nice...be indulgent...be less selfish", immediately followed by the next bullet point, "Do only what suits you. The perfect Zen attitude" I wondered who was asleep at the wheel, Ines or her editor. A good three-quarters of the book consists of capsule reviews of Paris' clothing, accessory, decor and food shops, and sections on parks, restaurants and cultural attractions. This is a useful guide– but the photos are murky, as if taken with a phone, the writing slapdash. After reading this sloppy pastiche, I'm even more grateful for the work of unpaid, keenly observant bloggers (see my blogroll) and commenters. At the same time, I enjoyed de la Fressange's confidence and less-is-more stance. She does have some original thoughts, like "Get dressed listening to 'Dead Flowers' by the Rolling Stones", and my personal favourite, "Do not feel obliged to buy 'fun' clothes." "Parisian Chic" is like a box of Ladurée macarons: tempting at first, but hardly a satisfying meal. Still, who can resist that gorgeous, raffinée Parisian package? The whole blogshpere seems to be buzzing about this book. Thanks for review. I think this is pretty much what one expects from a 'celebrity' style guide. While on the subject, which style based books would you recommend. Ones that aren't just about pretty pictures. Oh I just bought that book on Amazon! Oh well, I'll give it to my teenaged daughter, she has the same figure as Ines! CHE: Depends on what you're looking for. I like Kendall Farr's "Pocket Stylist" for basic dress-your-shape advice, and her new "Style Evolution", also "Forever Cool" by Sherrie Mathieson (North American style, though). My all time favourite is Genevieve Daraiux' "Elegance", written in the '60s, now reissued. Of its time and class, but much still applies, *if* you like quiet elegance and discretion. Finally, if you can slog though all the exercises, "Style Statement" by Danielle LaPorte and Carrie McCarthy gets you to a simple statement that guides your choices. I liked it but some friends found it impossible. I did not enjoy anything by Nina Garcia and Isaac Mizrahi's "How to Have Style". linda: Have a flip through it anyway, you may have a different response. The photos are awful, look like they were taken on a cheap phone. Sounds like a "get it from the library" book at best. I agree with you that there is lots of good info on the web... starting HERE with your blog. Thanks for what you do. What I liked about this book as opposed to so many of those "French chic" style books is that she lays out *specifics. * Not that vague "French women are selective" or "don't wear too much makeup" kind of guidance. Whether you agree with them or not, at least one doesn't need to try to interpret, "hmmm, what does the author mean by ___?" 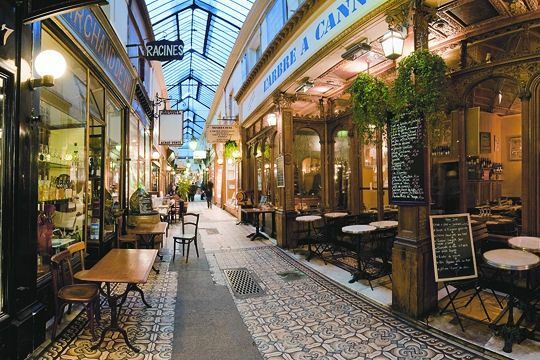 I'd say if you're planning to visit Paris either for the first time or with shopping in mind, this is a great guide. And I was happy to see that we've visited all but one of her favorite "secret" museums! I thought the section on what to do with kids was très charmant. Oh dear, I did not know I was wearing a "preppy cliche" daily when I put on a pearl necklace and earrings. This will just have to be a broken rule, for me, because I love them and they suit me! I really appreciate everyone's frank discussions about this book. I was looking forward to buying it because the concept sounded great but having read your analysis I think I'll save my $$ for something with more substance. Maybe a good biography of a stylish woman! Any of you have recommendations? I've been very into reading non-fiction lately and have enjoying a few very good biographies that I'm interested in more! I pre-ordered this book ages ago, having worshipped the ground she walked on as a teenager (and today, who am I kidding). Thanks for the review. I can be slightly less obsessive about checking my mail. I hated Sherrie Matheson's Forever Cool book myself. It featured stereotypical middle agers trying to appear hip but failing IMHO, featuring things like the spiky hair with bright coloured glasses and oddly colored clothes. I do believe that strange colours really age women, I can never understand why I can check out J Crew for e.g. and see a really nice palette of shades and then if I go onto Talbots for e.g. to get t-shirts that are cut to fit more mature frames, the colours suddenly morph into looking like they are from a kids box of crayons or more suitable to toddlers. You can't even find a basic grey tee shirt this season but orange and peach and pastel pinks galore. Dala: Thanks! If you want to see (young) French women day to day Garance Doré's blog is fun (www.garancedore.fr). Pseu: Yes, there are specifics, at least far more than some texts. I think our readers are astute enough to ignore fiats like "loafers and ballet flats suit for everybody". Francie: Never you mind. As she says, "Worship no idols"! Anonymous: The problem with bios of stylish women is that their stories do not help me (especially when the woman-such as Nancy Cunard and the Duchess of Windsor- led lives of the mega-rich) and some stylish women (for example, Chanel) were not especially admirable as people. I do like biography, though! Pseu: Sorry, that was "suit everybody". I'm rushed today. Anonymous@11:22: I agree the book is "bright"- maybe b/c Sherrie is based in California. However, where I live, there are so many 50+ women in frumpy elastic waist pants with running shoes or the opposite, Forever 21 skimpy tops and jeggings, that I was happy to see her show some alternatives. The before and after photos... do you not think they were better after? I have a "mature frame"- need good bust support- so J. Crew tees, cut with mostly tight, high armholes and narrow bodies, do not suit me. But Talbot's is just not well cut, even if I go down a size. I've about forsaken Talbot's but they do make trouser jeans long enough for me. And the colours- you're right! I wonder- do women like the style books that mostly echo the way they already dress? I just had to buy the book because I love Ines. That's all there was to it. Her down to earth charm is just irresistible to me. I'll admit to having been tempted as I am a big fan of Ines, but I have not yet bitten. Perhaps I am a bit jaded. I tend to agree with your recommendations of style books above, and love Daraiux. 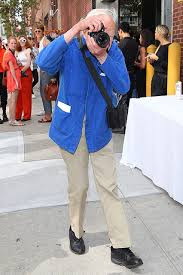 I will also admitting to having a couple of Nina Garcia's, not that I take them seriously, mostly for the pictures and because they are fun little mindless romps. We all have our more frivolous moments, no? I thought Mizrahi's book was awful. It appears that I shall sit on the fence a while longer. I totally agree about Talbots t-shirts. They are made in garish colors and the cut is frumpy. Usually they are too wide and too short for me. I did buy a J. Crew knit shirt (not really a t-shirt) recently. It is strictly for very casual wear (I have it on now) and is navy/white stripe with a cotton mandarin collar, three quarter sleeves with three button cuffs. I bought it in a size XL as the store did not have a size L. It's oversized, but about right to wear with jeans or white pants in a very casual setting. I do not understand why Talbots cannot get their colors right. I think she looks great and seems genuinely nice, but probably apply most of that that I can (being short, plump and impecunious). I am wearing leggings, under a skirt (both black) on my bicycle. If I had Ines' build, sure I'd be in skinny jeans. I don't necessarily agree with her about "ethnic" weaves and batik. We all know what she is avoiding - the craftsy-waftsy look, or a certain fairtrade look that only suits younger people, but batik and ethnic prints and weaves can be subtle and elegant. I find the too-small jackets bizarre and unsuited to a woman our age, no matter how reedy. And I'm very disappointed about the photo - we want that kind of book to be eye candy, to peruse when we don't feel like serious reading. I'll definitely look for it in the library or leaf through it in a bookshop though. Just a note to let you know that i've linked to this review. This is exactly the review I was trying to find. You are a wonderful writer and a sharp observer -- I've mentioned these points on other occasions -- so I can't thank you enough. Ines is Ines. She can, for scores of obvious reasons, get away with much more than the rest of us. Moto boots, now really. . . I think the most gorgeous, ageless, elegant accessory is her smile. I know that seems trite, but truly, it's joyous and mesmerizing. She also has a wonderfully sultry speaking voice and she has that difficult to define, innate charm. Please forgive me for being MIA. You know I'm a huge fan toujours. Tish: So good to hear from you! A sultry voice is a vastly underrated asset, b/c it does not show up in photos, and a woman can buy neither the voice nor innate charm. lagatta: I think she means leggings on their own, not that I think you need her approval! I'll lend you my copy. che: Thanks, I like your blog! Susan: Was in Talbot's today to grab a pair of trouser jeans on sale. Pastel land- the place looked like a Florida retirement home. Just closed my eyes to it and headed to the black denim. pfft,not moto boots or converse. So, what do you see that's "cool"
Anon: A lot of her advice addresses what's cool, and I agree: Great cut, good teeth (but not that glow in the dark white), natural- looking, subtle makeup. Click "Style" in my labels list, to read many posts on items I think are cool. Caveat: my taste runs to the minimalist, and I rarely wear the brightest colours. The biggest "uncool look" I see (in my large city) is 50+ women trying to look like In Style clones, in tight jeans, dead-looking blowouts and obvious Botox. You have inspired me to do a post on this, should be up in a week or two, thanks! wouln't be looking for "punch"of color guidance and inspiration. Strict Anon: My blogging eyes are bigger than my blogging stomach, with the move ramping up doubt this will get posted b/f mid next month. Thanks! 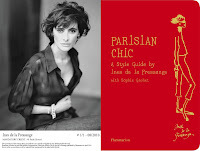 I'm sending "Parisian Chic" back to Amazon, as it was insipid, and I only browsed half of it. I'm just starting "face it" by Vivian Diller, hoping for more substance. I'll let you know if it's any good. I am the only who thinks that she is trying too hard. Just because she won the genetic lottery and will forever have the figure of an adolescent boy, does not mean that she should be held up as a style icon. Common sense tells us that neon colors and micro minis are just in bad taste, no matter our age. We don't need La Fressange to tell us so. Thanks for this post. Sometimes I feel like I am the only only woman in the bloggosphere who doesn't think that French women are all that. Don't get me wrong, I like them personally, I just don't think that they are all that fashionable! On this topic I can't help but be contrarian. I enjoyed the book immensely, but really hated the photography for the most part ... especially the pictures of the essential shoes. Non, non, non! I bought the book, and enjoyed it, despite the weaknesses. It's almost like a self-published ebook. Hearty cheers for "Style Statement" -- a great book. My pet peeve in the middle aged style book market is the emphasis on the negative: Charla Krupp and her choice of words just make my self esteem take a plunge every time I pick up one of her books. Good, you'll have something fun, other then the move, to occupy your mind in the weeks ahead. I look forward to your future post. This much I know is true...Shades*sunglasses* are always cool.